IF YOU ARE UNDER THE AGE OF 21, PLEASE EXIT THIS SITE NOW. 1. Agreement. This Term of Use agreement ("the "Agreement") specifies the Terms and Conditions for access to and use of Mo Beta Glass CO, LLC ("Mo Beta Glass") (the "Site") and describe the terms and conditions applicable to your access of and use of the Site. This Agreement may be modified at any time by Mo Beta Glass upon posting of the modified Agreement. Any such modifications shall be effective immediately. You can view the most recent version of these terms at any time at mobetaglass.com. Each use by you shall constitute and be deemed your unconditional acceptance of this Agreement. 3. Ownership. All content included on this site is and shall continue to be the property of Mo Beta Glass or its content suppliers and is protected under applicable copyright, patent, trademark, and other proprietary rights. Any copying, redistribution, use or publication by you of any such content or any part of the Site is prohibited, except as expressly permitted in this Agreement. Under no circumstances will you acquire any ownership rights or other interest in any content by or through your use of this Site. 4. Intended Audience. This website is intended for adults only. This website is not intended for anyone under the age of 21. 5. Trademarks. 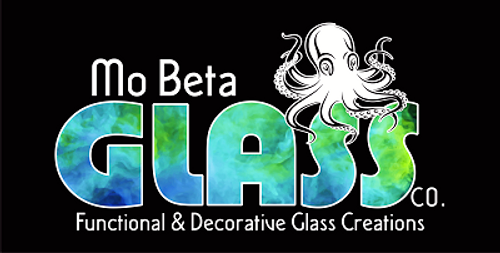 MO BETA GLASS and others are either trademarks or registered trademarks of Mo Beta Glass. Other product and company names mentioned on this Site may be trademarks of their respective owners. 6. Site Use. Mo Beta Glass grants you a limited, revocable, nonexclusive license to use this site solely for your own personal use and not for republication, distribution, assignment, sublicense, sale, preparation of derivative works, or other use. You agree not to copy materials on the site, reverse engineer or break into the site, or use materials, products or services in violation of any law. The use of this website is at the discretion of Mo Beta Glass and Mo Beta Glass may terminate your use of this website at any time. All products on this website are intended for legal use and may not be used, or discussed in a manner that is illegal. As the consumer it is your responsibility to know your local and state laws before making your purchase. It is illegal to use drug paraphernalia slang when referring to one of our tobacco pipes in most states. If you do, you will be denied service as required by law, any communication that includes the use of such illegal terms will not be answered by us and will be deleted from our system with out notice. Also, any governmental employee, agency, or agent must identify themselves to the operators of Mo Beta Glass Co. upon their entering the site, and when ordering any products from our site. Mobetaglass.com reserves the right to request a scan of any customers photo ID for age verification before shipping an order. All of our products are traditionally and solely intended for tobacco use or concentrated essential oils, by legal adults. You must be 18 years old (21 in some areas) to purchase anything from this website. It is your sole responsibility to know your state and local laws regarding the possession and use of tobacco pipes and accessories. If you purchase any tobacco products from mobetaglass.com and you are under the legal age to purchase tobacco and/or tobacco accessories including, but not limited to, water pipes, you are subject to local prosecution and fines. Your legal guardians shall be solely liable for any damage resulting from any infringement of such applicable laws. You agree that any tobacco products, accessories, or supplies purchased by you will be used for lawful purposes, including tobacco or legal blend (as defined in your Municipality) use only and that it is legal in your state to purchase tobacco-related products. Use of these products is entirely at the risk and discretion of the user and mobetsglass.com will not be responsible for any use or misuse of the products sold herein. 8. Shipping and Returns. Mobetaglass.com does not offer shipping to third parties as gifts or otherwise. We are only able to ship our product(s) to those who have purchased it and agreed to our terms and conditions. Therefore we will only ship to the credit card holders name. Mobetaglass.com only accepts returns on un-used products, and a return claim must be filed within seven days of the delivery date. We are not able to accept returns, exchanges or offer full or partial refunds for products that have been used. Please inspect all items prior to use, once used they cannot be returned for any reason. If you decide to send an item back, please be sure to package it the same way it arrived to ensure that it does not break on the way back to us. We recommend all return shipments purchase insurance covering the full amount of the order. If you chose not to purchase insurance and your shipment is damaged, Mobetaglass.com cannot offer you a refund. Once the item has been inspected and approved for re-stocking, a full refund for the purchase price will be issued. If you are returning an item due to preference and not a Mobetaglass.com error (wrong product/DOA/piece missing) you will receive a refund equal to the full purchase amount minus the cost of shipping. Shipping and handling fees are non-refundable, and buyer is responsible for any return shipping fees incurred. 9. Indemnification. You agree to indemnify, defend and hold Mo Beta Glass and our partners, employees, and affiliates, harmless from any liability, loss, claim and expense, including reasonable attorney's fees, related to your violation of this Agreement or use of the Site. 10. Disclaimer. THE INFORMATION ON THIS SITE IS PROVIDED ON AN "AS IS," "AS AVAILABLE" BASIS. YOU AGREE THAT USE OF THIS SITE IS AT YOUR SOLE RISK. MO BETA GLASS DISCLAIMS ALL WARRANTIES OF ANY KIND, INCLUDING BUT NOT LIMITED TO ANY EXPRESS WARRANTIES, STATUTORY WARRANTIES, AND ANY IMPLIED WARRANTIES OF MERCHANTABILITY, FITNESS FOR A PARTICULAR PURPOSE, AND NON-INFRINGEMENT. TO THE EXTENT YOUR JURISDICTION DOES NOT ALLOW LIMITATIONS ON WARRANTIES, THIS LIMITATION MAY NOT APPLY TO YOU. YOUR SOLE AND EXCLUSIVE REMEDY RELATING TO YOUR USE OF THE SITE SHALL BE TO DISCONTINUE USING THE SITE. 11. Limitation of Liability. UNDER NO CIRCUMSTANCES WILL MO BETA GLASS BE LIABLE OR RESPONSIBLE FOR ANY DIRECT, INDIRECT, INCIDENTAL, CONSEQUENTIAL (INCLUDING DAMAGES FROM LOSS OF BUSINESS, LOST PROFITS, LITIGATION, OR THE LIKE), SPECIAL, EXEMPLARY, PUNITIVE, OR OTHER DAMAGES, UNDER ANY LEGAL THEORY, ARISING OUT OF OR IN ANY WAY RELATING TO THE SITE, YOUR SITE USE, OR THE CONTENT, EVEN IF ADVISED OF THE POSSIBILITY OF SUCH DAMAGES. YOUR SOLE REMEDY FOR DISSATISFACTION WITH THE SITE AND/OR CONTENT IS TO CEASE ALL OF YOUR SITE USE. 14. Applicable Law. You agree that the laws of the state of Oregon, without regard to conflicts of laws provisions will govern these Terms and Condition of Use and any dispute that may arise between you and Mo Beta Glass or its affiliates. 16. Waiver. The failure of mobetaglass.com to exercise or enforce any right or provision of this Agreement shall not operate as a waiver of such right or provision. Any waiver of this Agreement by mobetaglass.com must be in writing and signed by an authorized representative of mobetaglass.com. 17. Termination. Mo Beta Glass may terminate this Agreement at any time, with or without notice, for any reason. 18. Relationship of the Parties. Nothing contained in this Agreement or your use of the Site shall be construed to constitute either party as a partner, joint venturer, employee or agent of the other party, nor shall either party hold itself out as such. Neither party has any right or authority to incur, assume or create, in writing or otherwise, any warranty, liability or other obligation of any kind, express or implied, in the name of or on behalf of the other party, it being intended by both parties that each shall remain independent contractors responsible for its own actions. 20. Use of Site. Harassment in any manner or form on the site, including via e-mail, chat, or by use of obscene or abusive language, is strictly forbidden. Impersonation of others, including a Mo Beta Glass or other licensed employee, host, or representative, as well as other members or visitors on the site is prohibited.